The Martha’s Vineyard Drug Task Force detained Hannah Garde, 24, of Vineyard Haven, last week while executing a search warrant in Edgartown, then arrested her after finding two grams of cocaine concealed between her buttocks, according to an Edgartown police report. 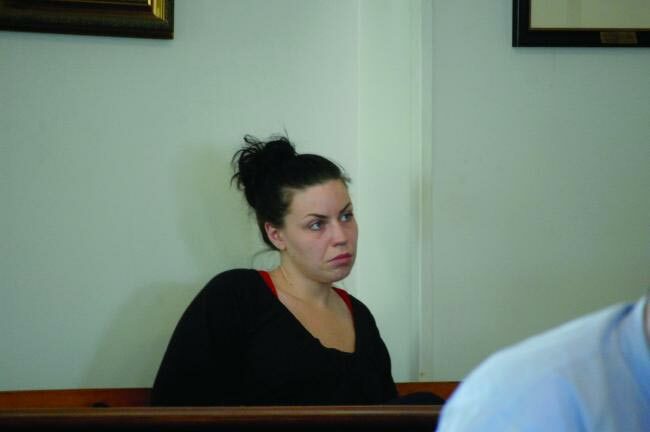 Ms. Garde was arraigned in Edgartown District Court on a charge of possession of cocaine with intent to distribute. Associate justice Joseph I. Macy set bail at $10,000 and ordered Ms. Garde back to jail for violating the terms of her probation on previous drug charges. On Febrary 4 of this year, Ms. Garde pled guilty to possession of heroin and conspiracy to violate drug laws. She was given a nine-month suspended sentence on each conviction, along with two years of probation. Those charges stem from a November 2008 raid on the Garde family home on West Spring Street. Two of Ms. Garde’s siblings were among a total of six arrested in that raid. Her brother, Kaleb Garde, is currently serving a five-year state prison sentence for dealing heroin. Arguing for bail of $15,000, Cape and Island assistant district attorney Laura Marshard told Judge Macy that when police executed a search warrant on the home at 36 Fisherman’s Knot Road in Edgartown, they found Ms. Garde in a room with scales, cellophane baggies, and a white powder commonly used to cut drugs. In addition to the cocaine, police said she had $100 stuffed in her bra. Police say they focused on the home after neighbors reported apparent drug activity to authorities. Attorney Charles Morano, who represented Mr. Rowe at the bail hearing, said Mr. Rowe works for the New York City sanitation department. “He was here visiting, planned to stay a couple of weeks, then go back to New York,” Mr. Morano said. “He’s a little too mobile for personal recognizance,” Judge Macy said. He set bail at $10,000. The two defendants were arrested separately, in different locations. Police said, however, they know each other and have been involved in drug activity together. Both defendants were ordered back to court today.